During her childhood she was mostly surrounded by classical music and got her basic musical education by studying a few instruments. At the age of 14 she started to listen to hip hop and house music and was intrigued, but still had to wait another 4 years until she was old enough to explore music and life in the night clubs. When she first entered a techno club in Frankfurt in 1993, she found exactly what she had been looking for. In the following years Vera started collecting mix-tapes and listened to uncountable DJ-Sets. She was a regular guest at the legendary techno club Omen in Frankfurt and at that time she developed her preferences for Chicago house, music from Detroit and the sound of Maurizio, Studio1, Thomas Brinkmann and the early Perlon and Playhouse releases. After spending almost 7 years on the dancefloor, Vera started buying records. Roman Flügel from Alter Ego was one of the first, who invited her to play at Robert Johnson in 2003 and soon after she became Resident DJ at Robert Johnson, one of Europes most respected and authentic clubs. 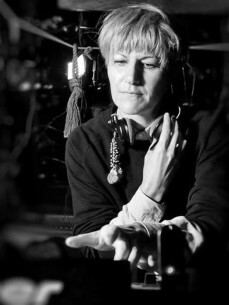 In 2005 the promoter of Frankfurt’s House Club Monza moved to Ibiza and started the weekly „Monza Club Ibiza" parties on the island – and on this party Vera got her first international residency. In 2006 she played at Space and DC 10 and after releasing her exclusive compilation mix CD for Monza Ibiza she made it into the clubs in all over Europe, such as Panoramabar (Berlin), Goa (Rome) Tea-Bar (London), Moog (Barcelona), Zukunft (Zürich) and many more. Vera stands for sophisticated, deep, electronic dance music, somewhere between deephouse and techno. She has started to work on her own definition of house music – bridging classic house with new influences. Her first track „In the nook" was released on Spanish minimal label Cyclical Tracks in December 2007. As Mara Trax, a collaboration with Miss Fitz aka Maayan Nidam, Vera produced two EPs in 2008, one on Cyclical Tracks and another one on Oslo Records Together with Federico Molinari she also released an EP on „Love letters from oslo“. But finally in July 2008 Vera has released her first solo EP on Cargo Edition.